Update - Almost 2 years later…. Coming up on my 2 year anniversary of my injury in just a few months, I wanted to update everyone on the current status. Although I’m still a little hesitant to stress it, my repair has been holding fine. My calf is almost back to 100% although I am still a little weaker on that side and have to “think” about doing calf raises. I have occasional, minor itching in that area although the area is noticeably different; in addition to the scar, there is very little hair grown back and the skin is much drier. The only ongoing pain I have is in my heel area. Even in good shoes, the heel pad on my foot gets very sore if I’m on my feet for more than a few hours. I can massage it to relieve some pain, but it generally aches the rest of the night. If I go barefoot (even in the house) or wear cheap shoes, I experience pain after only an hour or two. Welcome to all the new members, here’s to a speedy recovery for each of you. I continue to gain more and more strength each day and can now walk with no noticeable limp. I am still noticeably weaker in that leg, especially doing calf raises, but my gait is nearly normal and I can walk / run with very little issues. The only lingering issues are the scar area and heel. The scar area still gets red and a little inflamed when I’ve been on my feet for a while. The heel is my biggest problem to date. I have some amount of pain in my heel every day. If I’ve been on my feet a lot the heel pain is pretty severe to the point that I can’t hardly stand on it. Hopefully this will pass eventually as well. 1) He said I could stop wearing the walking boot effective immediately. 3) He said I could resume normal activity / working out two weeks after that (02/06/09). That was not at all what I expected just 12 weeks after injury and 10 weeks after the surgery! I was hoping that the boot would come off soon, but I certainly didn’t expect to be walking in a full pair of regular shoes that evening. Other than a little stiffness, the injury has been feeling pretty good. I have a small lump (acorn sized) at the site of the repair, but he said there wasn’t any reason to worry about it as he adds an extra layer when he repairs and it sometimes takes a while to dissipate (if it does at all). I’m still teaching myself to walk normal and sometimes my knee will buckle when I’m tired, which I assume is due to the weakened muscles in the calf / ankle area. The only movement that feels very uncomfortable is going down steps when the injured foot is supporting my weight as I move my good foot down. Went for my cast removal and follow up appointment on Monday, 12/1/08. Other than the 1.5 hour wait past my appointment time (is that Ortho doc’s in general or just mine? It’s every appointment!) things went well. Thankfully, there was zero odor when the cast was removed, very little dead skin, and the wound was healing nicely. The doc put me in a walking boot (DJO Maxtrax) and told me for the first 7 days I could gradually put more weight on it (always with the boot) until I was putting 100% of weight on it after 7 days. After that, he said I could try walking (always with the boot) with whatever aid I wanted; one or two crutches, walker, etc. He also gave me some stretching exercises and told me that with my range of motion he would hold off on starting physical therapy until my followup in one month. I’m hoping that with enough demonstrated improvement I can keep delaying or even avoid physical therapy. My calf had noticeably atrophied, but not as bad as I was thinking. I’ve also experienced almost zero pain in the surgical area, but my foot does turn various colors based on unknown factors. What has been other people’s experience with post-op swelling? I went and got casted 10 days after surgery (11/07/08) which went fine. I returned to work for a 1/2 day the following Monday and Tuesday (11/10 and 11/11) and had significant swelling. By significant I mean swelling to the point that the cast was literally air tight at the top and toes and flesh was bunched up / forced out of the top of the cast and my toes turned purple. After a few hours at work on Wednesday (11/12) I went home to elevate and have been working from home ever since. I’ve noticed that even now (11/18) if my leg isn’t elevated at least to waist heighth it starts to swell within 30-45 minutes and is airtight within 1.5-2 hours. Is that normal? Should I be concerned about it or just deal with it? I don’t want to cause complications / prolong the recovery but I’m also anxious to return to work. Back home in a cast…. Dr.’s appointment went fine, he said everything was progressing as expected. There were only 2 stitches to be removed, each about 12-14 inches long. Not sure how they “ran” them, but pretty neat and not what I expected as I thought there would be dozens of smaller stitches. I chose a black cast just so it would be less “obvious”, but they had a variety to choose from. The doc wasn’t happy with the angle they put my foot in, but said it was just a little more conservative than he wanted to go with. 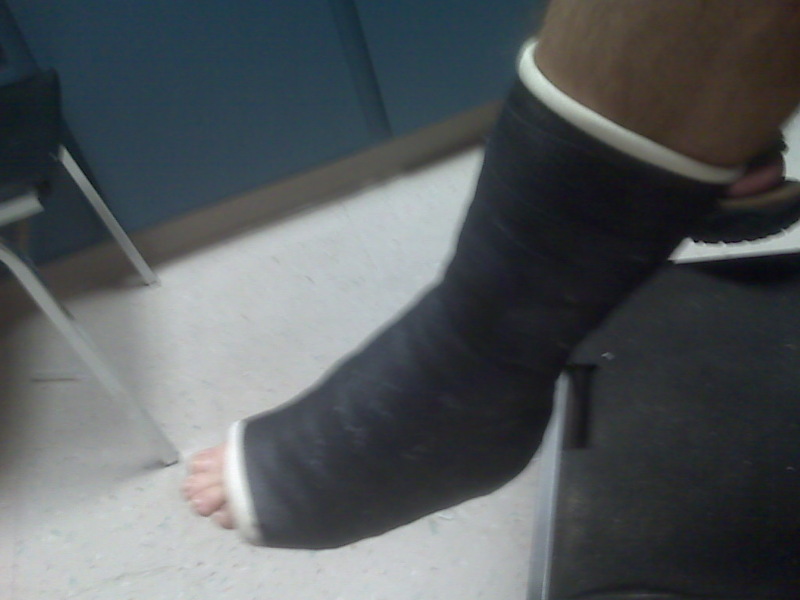 Next appointment is the Monday after Thanksgiving to have the cast removed and replaced with a boot. Today’s the big day! Dr.’s appointment at 10:15 a.m. to have the stitches removed and a cast put on. With any luck, I’ll also get released by the Dr. to return to work and hopefully be allowed to start putting weight on it. Slept a lot better last night thanks to a tip from someone on this site on how to sleep. I sleep on my side, and was not able to get comfortable on my back with my leg elevated. I took another blogger’s advice and laid on the side of my good leg, put two pillows on top of that leg, and rested the ATR leg on top of that. Kept it elevated and granted me some sweet sleep on my side. I also, again based on another blogger’s input, have been on a strict “every 4 hours” percocet cycle and it has helped tremendously. 1/2 a pill is still the max, but by taking it every 4 hours (yes, that means setting an alarm at night and waking up for a dose) the pain level has decreased substantially. I don’t know if it’s related or not, but I noticed that the intensity and duration of pain I felt when gettig upright to use the bathroom this morning was noticeably less. Speaking of using the bathroom……that’s my issue of the day. I haven’t had a bowel movement since Monday which means today is going on 4 days. I took a laxative yesterday (citrucel) but still no look. My appetite has diminshed greatly as a result and I’d like to get things moving again as I think it’d help me feel much better. Any tips on that would be appreciated. I’ve been drinking plenty of water. The full dose of percocet was making me sick (nausea, headache, dizzy) and so far 1/2 a pill is working better. A lot more pain is “sneaking” through but it’s manageable and worth it to not be sick. I’m also using one of those ice water pump machines at the recommendation of my Doctor and that has been a God send. It cost us $115 to rent it for the 10 days between the operation and the followup and it has been worth every penny as I don’t know how I could have easily iced the wound. I can definitely tell when it needs more ice and I would definitely recommend it to anyone even though insurance doesn’t typically cover it. Thanks to other blogs, I’ve been deliberately keeping pressure off the wound site by elevating my leg and lying sideways as much as possible. My worst issue with pain is when I get up to use the bathroom, the blood rushes to my leg and it hurts something fierce. I’ve learned to sit up in stages and allow the blood to slowly return which helps somewhat. This afternoon I’m going to (with my wife’s assistance) try and take a bath with my leg hanging out of the tub. We’re also going to remove the outer dressing just to get a peek to see if there is a lot of blood and to see if we can shift the ice water wrap around a little for comfort. I’m also curious if I have staples or stitches as my wife said the operation photo looked like a 5-6 inch incision. Great site, I’ll echo the comments from others in that I’ve learned more here than from the Doctor…. Went to the Orthopedic surgeon on Monday and he confirmed an almost complete rupture. He suspected some of the fibers might still be intact as I still had some up / down foot strength. He asked me to go get lab work down and scheduled me for surgery at 8:45 on Tuesday (next day / yesterday). Surgery went well, very nice hospital and staff. I opted for general anesthesia and they injected something to relax me, some anti-nausea medicine, and a narcotic before sedating me with gas. Post-op went well and I awoke with almost no pain and a moderate amount of grogginess. They gave me a Percoset and sent me on my way. Surgery began at 10:45 a.m. and we were in the car at 2:00 p.m. I was taking the Percoset every 4 hours but woke up this morning very nauseous, light headed, and a pounding headache. I switched to Advil and feel better but the pain is very noticeable. I might try to take a reduced dosage of Percoset. The wound was wrapped with some type of bandage that attaches to a cooler filled with ice and water to keep the leg cool. It is also in a splint and a pressure wrap. Wound care has been confusing. They sent us home with generic instructions other than to schedule an appointment in 10 days to remove the stitches. We called the Dr.’s office back and the nurse said to remove the bandage after 48 hours and gently wash the wound with soap and water and pat dry. She then said to put a “water proof bandaid” on the wound. I called back as that sounded fairly “casual” to me knowing that I would be in a cast in 10 days so I called back and asked about the splint. The nurse said “oh yeah, sorry, I forget to tell you to put the splint back on.” Not to be a worry wart, but I’d like to hear some input from others as to the post op wound care. 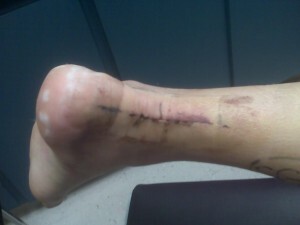 According to the Dr., I go back on 11/7/08 to have the stitches removed and a cast put on. The cast stays on for 4-6 weeks and then he’ll put me in a cam boot. I also have a photo of the surgery that I will post as soon as I get a copy. free robux on Back home in a cast…. uk essay on Back home in a cast…. normofthenorth on Update - Almost 2 years later….